As you see, for Android, you can only use nvprof. Nvprof is a command-line tool to profile CUDA applications and it will be explained in the next paragraph. If you look at the red rectangle at the bottom of the picture you will notice that CUDA APK profiling is not supported yet! 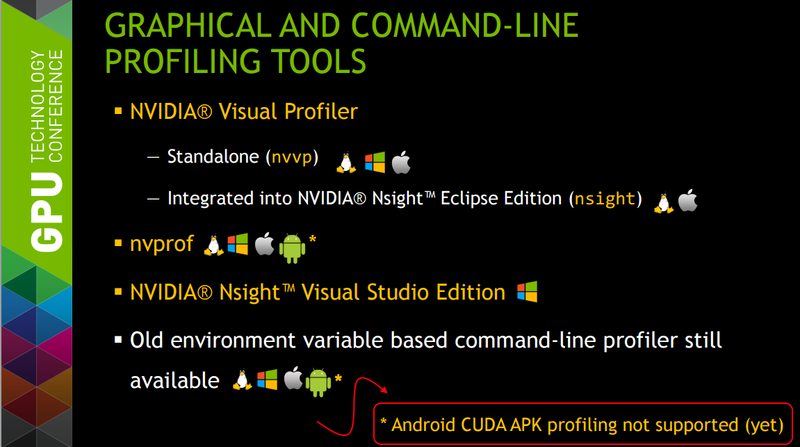 I.e., if you have in your APK any CUDA kernel, or calls to any library that uses CUDA….you simply can’t profile it. Luckily there is a workaround for that. The only way is to create a standalone and self-contained CUDA app. This must be deployed onto the Shield (manually, unfortunately) and profiled using nvprof. Nvprof is a handy tool. You can import its output into the NVIDIA NSight Visual Profiler for Eclipse available with the Android Works package. There is another limitation, well only if you are a Windows lover. In order to compile CUDA for Android you need to use the Android NDK and the CUDA development kit on…Linux! Currently there is no way to compile CUDA kernels using nvvc shipped with the dev kit on Mac or on Windows. During the installation process, you will be asked to plug the Shield. The profiling tool for CUDA will be deployed accordingly by the installer into this folder (on the Shield): /data/cuda-toolkit-x.0 (where x is the CUDA version being installed. — find my device Android version). You will need to deploy and run the app using the built in Android shell (adb shell). This can be a pain in the neck. I suggest you reading some tutorials on how to root the Shield. printf("Sum of %f + %f = %f\n"
Now let’s compile the CUDA vector add for the Shield. Deploy an APK using Eclipse or Visual Studio is pretty straightforward. You can use anu GUI (Android Studio, Eclipse, Visual Studio). However, it is not the same for a manual CUDA compilation step. #in the libs android I used the version android-19, but you can replace with any version you like that is available in the NDK. Using the makefile above will compile our vectorAdd.cu into an executable for Android. Please note that I’m using the NDK version r10c and targeting a specific Android version (android-19). These are not fixed parameters and you can change them in your makefile accordingly with your NDK installation. *As a side note please keep in mind that upload a file onto the Shield you need a rooted device and permission to write to the data folder (or any other folder in the Shield filesystem). Last step is to collect the data. Let’s access the Android shell and run nvprof. x.y in the cuda-toolkit-x.y folder should be 6.0 or 6.5 depending on the NDK version you have previously installed. export TMPDIR is needed to set a temporary folder which is used by nvprof to save its local data. Eventually we can profile the application calling nvprof and the CUDA program uploaded. By using the option –analysis-metrics is possible to import the generated output.nvvp file into the NVIDIA Visual Profiler (in Linux available using the nvvp command in the shell or in Windows in the folder C:\Program Files\NVIDIA GPU Computing Toolkit\CUDA\v7.0\libnvvp\nvvp.exe ). Once you have the metric file locally, you can import it into the Visual Profiler to analyze the metrics of your CUDA program. Do you have any full example on android to profile an cuda program?